Anyone able to help a noob? 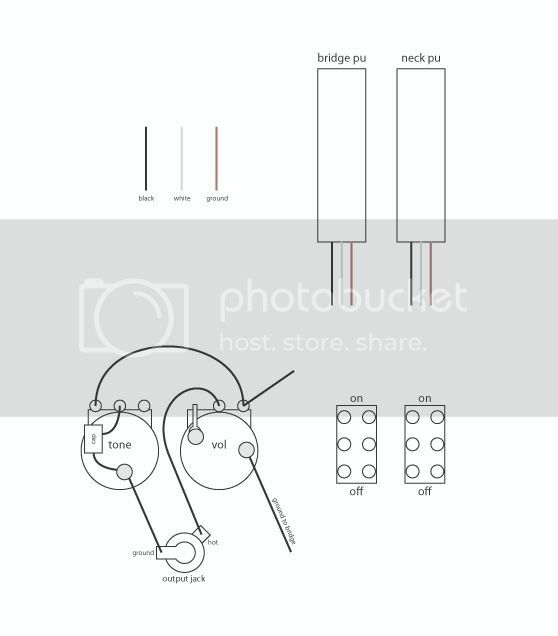 Need to figure how to wire two on-off switches. There's one for each pick up. Pickup wires are black, white and ground. The switches are sliders with six pins. All goes to 1 vol and 1 tone. This is what I've got so far. Not quite sure how to wire in the switches? Anyone? What kind of pickups are these? Actives? I kind of doubt red is ground. It's not red. It's uncovered wire. The brown (red) is just to differenciate between them. Was going to update the pic with a few corrections but I figured out how to wire it up now. cool, cool, cool. I'm not totally sure that this is the best way to do it, but this is how I'd do it. The dpdt switches are kinda over kill since you only need two terminals, spst or spdt. 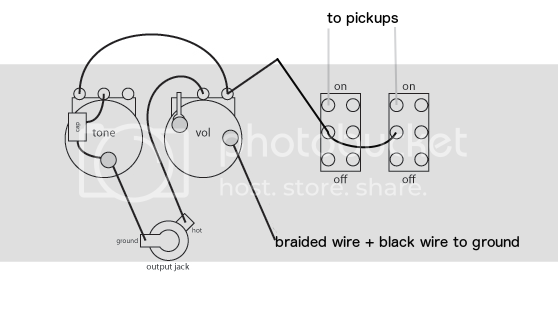 I'm assuming that the white wire is hot and the black is supposed to be grounded with the braided wire. Yup. That's what i've done pretty much. The black is actually red but I wasn't looking at it when I did the sketch, same thing anyhoo. Yeah, I've since seen that there's a switch with just the three conections. At the time I just went for white jaguar style ones as that's what I'm used to. Cheers for the advice. I'll see if I can post some sound clips or some such when it's set up a bit better. It's playing ok, but the frets need a bit of work as the zero fret is sitting a tad low.